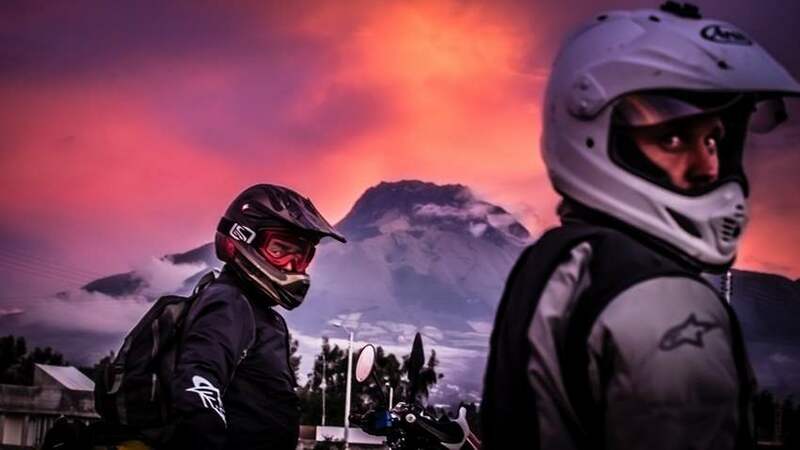 The 6-day luxury motorcycle tour crisscrosses the northern Ecuadorian Andes, a part of the country that still feels enigmatic, subtly inaccessible and not saturated with tourists. It's an area known for its pristine wildlife refuges, coffee plantations, timeworn colonial buildings and therapeutic hot springs. The route will bring you to a huge variety of climates, cultures and altitudes. You'll visit the beautiful cloud forests on the Western Slopes of the Andes, soak in five different unique volcanic hot springs, haggle at the indigenous markets in Otavalo, savor freshly grown coffee from the some of the world's top growers, and revel in the outstanding vistas all along the way. Each night's accommodations are in carefully selected exclusive, luxury haciendas and wilderness lodges that are as diverse as the terrains you will traverse. The hospitality of each venue has its own particular regional character which is evident in every gesture. 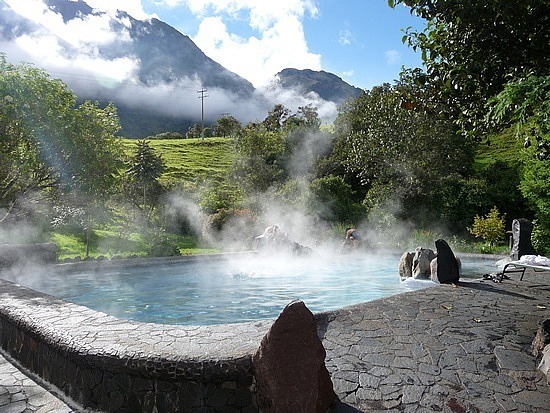 Non-touristy hot springs located in the small town of Oyacachi on the eastern slopes of the Andes. Reachable only by dirt road. 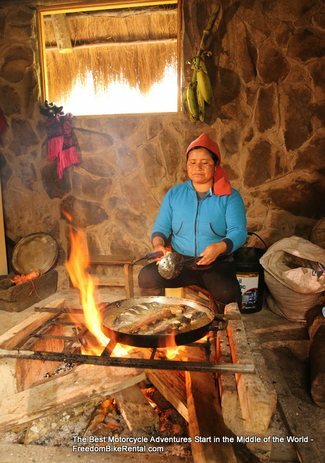 See how Ecuadorians use traditional method to bake bricks for construction using clay and huge furnaces fired by wood. High altitude sulfuric lakes in the El Angel Park. The crooked ancient cobblestone road will bring you to this magnificent location. The Aguas Hediondas (stinky waters) will have you feeling remarkably refreshed with a lowered blood pressure and smelling like chicken soup. The Cayambe-Coca National Park is one of the country's best protected natural areas. Special permits are required for entrance. The El Angel National Park is home to the frailejon plant and fantastic off-road riding. The cementary in Tulcan is world-famous for its amazing topiaries. 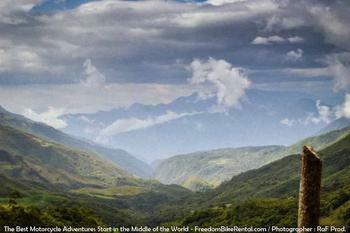 You'll begin this 6-day "Dirt Deluxe" guided tour from our shop in Quito, Ecuador. In 1978, Quito became the first place on the planet to be designated as a UNESCO World Heritage Site for having the best-preserved historic center in all of Latin America. 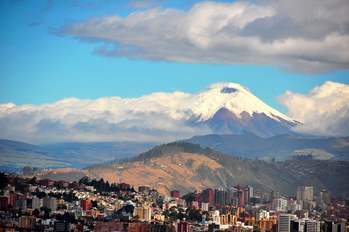 Quito is high on the Antiplano Plateau (the highest capital city in the world) in the Andes at 9,350 feet. We suggest that you arrive a day or two early to experience our magnificent capital city while getting acclimated to high altitude before beginning the tour. 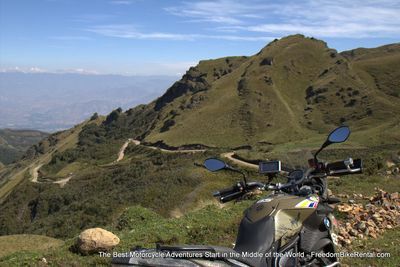 During the first morning of the tour you’ll be outfitted with the motorcycle of your choice and given a thorough orientation answering all questions concerning local customs, rules of the road, riding signals, Ecuadorian driver courtesies, and more. We head out of Quito, rising in elevation as you climb the foothold of the Pichincha volcano, getting absolutely spectacular views of the city below. Soon we are on the "Route of the Hummingbird" or "Ecoruta del Quinde." This route is famous for its incredible natural beauty. It has won several awards from the Audubon Society for the large number of bird species that can be seen. Although the area is relatively small in size it is one of the most bio-diverse on the planet, counting thousands of species of butterflies, plus hundreds of different reptilian, amphibian and bird species - including several types of toucans and hummingbirds. Once over the pass, your surrondings will go from urban to country in an instant. You are now surrounded by green pastures and the sounds of the city are replaced with the sounds of rolling brooks, mooing cows and chirping birds. You will descend into the smal village of Nono.- a quaint, friendly little place that feels a world away from Quito. The road is now an unimproved, hard-packed dirt road that will take you deep into the Nono Biological Reserve - one of the most biologically diverse places on the entire planet. We may stop for a swim in the beautiful Guagrapamba Waterfall. which is just along the route and can be reached after a short hike. The ride will continue along these country roads with virtually no traffic bring you high into the elevations and bring us to the "Virgen de Camino Mirador" overlook. We wil stop here and get some great views of the valleys below. Then we descend along a rolling river of cold, clear water and into the rainforests for a completely new biological habitat. You may catch a glimpse of some wild toucans or brightly colored frogs. Back on the road, the aromas and sounds of the cloud forest you will experience will be something that stay with you long after this ride is over. We will stop for lunch in the Bellavista Cloudforest Bird Lodge. This lodge has a wonderful restaurant and a staff that is very happy to share its knowledge of the wildlife in this reserve. From Bellavista, we descend onto the Western Slopes of the Andes and through the hamlet of Santa Rosa - a farming community. You'll enjoy the scents of the wild orchids and other flowers that line the road here. Then we rejoin the paved road and turn onto the road that takes you to even lower elevations and into the warm microclimate of the town of Mindo. This funky, eclectic town offers great restaurants, bars and activities such as zip-wire canopy tours and innertube rides down white water river. Other attractions include a butterfly sanctuary, a tarabita (hand powered cable car over a waterfall) and an orchid garden. We visit El Quetzalfor a tour that will educate and entertain you. El Quetzal is an organic chocolate factory and they provide tours to learn about how cacao is grown, harvested, fermented and turned into chocolate. The tour (included) includes a chocolate bar and tasting of different chocolates. If you want to learn more about coffee growing, harvesting, processing, roasting and proper preparation of coffee please ask your tour guide for more information. After visiting the town of Mindo, you will ride into the Septimo Paraiso Cloudforest Reserve, a private protected area, created in 2001, with the aim of saving and preserving the forest and the diverse ecosystems that are contained within it. It is managed by the Green Mindo Foundation, which is in charge of the conservation and the study of its 420 hectares of pre-montane and montane cloud forest. 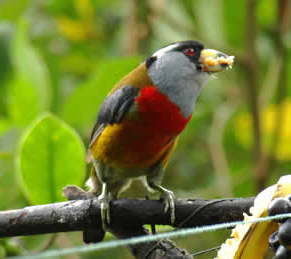 The Reserve has one of the largest bird counts of the north-western area of Pichincha, with 328 species of birds. Several species of mammal have been found; such as puma, spectacled bear, black howler monkey, capuchin monkey, Andean coati, armadillos, white tailed and brocket deer, two toed sloth to name just a few. Also an incredible number of reptile and amphibian species had been spotted, plus an overwhelming number of plant species. The isolation of the region has created one of the most delicate, but rich and complex ecosystems known in the Mindo region. You will check into your room at the Septimo Paraiso Cloudforest Lodge, winner of the "Cloudforest Hotel of the Year" Award from Luxury Travel Guide. The lodge features a heated pool, large unheated pool and jacuzzi plus a billiards room and fully stocked bar. We'll enjoy a gourmet, all you can eat Ecuadorian dinner including fresh juices, soups and desserts. You'll want to get the recipes from Ana Lucia - owner and gracious hostess at the Lodge. A private protected area, created in 2001, with the aim of saving and preserving the forest and the diverse ecosystems that are contained within it. It is managed by the Green Mindo Foundation, which is in charge of the conservation and the study of its 420 hectares of pre-montane and montane cloud forest. The Reserve has one of the largest bird counts of the north-western area of Pichincha, with 328 species of birds. Several species of mammal have been found; such as puma, spectacled bear, black howler monkey, capuchin monkey, Andean coati, armadillos, white tailed and brocket deer, two toed sloth to name just a few. Also an incredible number of reptile and amphibian species had been spotted, plus an overwhelming number of plant species. The altitude within the reserve drastically changes from 950 meters to 1650 meters above sea level. In addition, the isolation of the region has created one of the most delicate, but rich and complex ecosystems known in the Mindo region.a private protected area, created in 2001, with the aim of saving and preserving the forest and the diverse ecosystems that are contained within it. It is managed by the Green Mindo Foundation, which is in charge of the conservation and the study of its 420 hectares of pre-montane and montane cloud forest. The Reserve has one of the largest bird counts of the north-western area of Pichincha, with 328 species of birds. Several species of mammal have been found; such as puma, spectacled bear, black howler monkey, capuchin monkey, Andean coati, armadillos, white tailed and brocket deer, two toed sloth to name just a few. Also an incredible number of reptile and amphibian species had been spotted, plus an overwhelming number of plant species. The altitude within the reserve drastically changes from 950 meters to 1650 meters above sea level. In addition, the isolation of the region has created one of the most delicate, but rich and complex ecosystems known in the Mindo region. After a hearty breakfast of fresh exotic fruit juices, home-baked breads, pancakes and eggs, we head out of the cloud forest reserve and take a dirt road heading north. We pass the rolling bright green hills of the region, and tomato, avocado and fruit orchards. We'll go for a short 5 minute hike into the rainforest and refreshing swim in the Cascada de la Piragua - a swimming hole popular with the locals. We pass through the town of Nanegal with its friendly residents and manicured town square, heading down in elevation and further into the lower elevations using unpaved farm roads. The weather is warm and you'll cross other riviers and children playing in waterfalls alongside the road. We enter the Rio Intag valley - known for the premium coffee grown in this region. We will stop at the Nangulvi Hot Springs. The small complex offers several pools at varying temperatures and a fantastic fixed-lunch restaurant at the edge of the roaring Intag River. The town of Apuela is home to the Rio Intag Coffee Growers' Association and we will have a quick tour here of their coffee drying, sorting, processing and roasting operations. You'll want to take a few bags of the coffee home with you. From Apuela, the cobblestone road climbs in elevation, then descends, then climb again, achieving great views of 100+ foot cascading waterfalls and fragrances of pine, eucalyptus and something that smells like an artificial "rainforest fresh" air freshener - only this is the real thing and so so much better! You will arrive at the Cotacachi-Cayapas National Forest and the Cuicocha (guinea pig) lake - a crater lake that was thought by the indigenous people to be a tunnel to the Pacific Ocean. Dirt and ancient cobblestone roads take us peacefully into the city of Otavalo. Otavalo textiles are famous for their history and quality. The Otavaleños were skilled weavers even prior to the Incan rule. The Spanish set up workshops to employ the already skiled weavers and soon, through technological advancements, the Otavalo weavers supplied textiles to most of Latin America. Today the area has a number of wool mills and looms and produces high quality textiles. A visit to the Indigenous market at the "Plaza de los Ponchos" in the center of Otavalo is a feast for your eyes and an opportunity to bring back some great gifts for your friends and family. Tonight, we are in for a treat! We will stay in the renovated 17th century comfortable and luxurious Hacienda Cusin. Hacienda Cusin was purchased at an auction from Philip III, King of Spain by the prominent Luna family in 1602. The purchased estate, an abraje or sheep farm, comprised of two valleys of Gualaví and La Rinconada, and all the land between the valleys and the lake, approximately 100,000 acres/50,000 hectares, held until Land Reforms in 1945 and 1964. Hacienda Cusin was named for the mountain at the head of the valley of La Rinconada. Today, it is owned by a wealthy American and her English husband, and they have put millions of dollars into its restoration. The mountain’s name is uncertain, although three possibilities are likely. First, that Cusin was the name of an indigenous chief who fought against the Incas in the early 16th century, just before the Spaniards’ arrival. Secondly, a type of white beetle, a cuzo, cut-zo, (Quechua), a delicacy, that appears briefly in November. Cusin’s coat of arms, found on dishware and stationary, is a cuso’s carapace. We'll enjoy a dinner featuring traditional, local culinary flavors and with a glass of wine in their elegant dining room before you settle into your room appointed with the high quality textiles made in Otavalo. After a wonderful hacienda breakfast, we ride along the shore of Lake San Pablo, where the locals still cultivate the reeds to make baskets and other items. 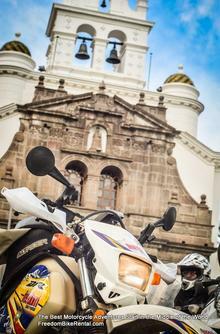 We ride to the town of Cotacachi, at the base of the Cotacachi Volcano. Cotacachi is famous for its high-end leather goods and leather tanneries that still use traditional, vegetable methods of tanning leather. We'll meet a local leather tanner that uses traditional vegetal (not chemical) methods to create high quality hides. There are many fantastic shops in the center of town where you can get jackets, belts, wallets and boots at fantastic prices. The town also has a thriving American and Canadian population where the local coffee and pastry shops serve as meeting places. We take the back roads out of Cotacachi which are timeworn, serpentine cobblestone roads leading past grandiose farms producing long-stem roses and other cut flowers - one of the major exports of Ecuador. The roads will cross through a series of small colonial towns with truly authentic fading pastel adobe buildings, iron street lights and cobbled sidewalks. Eash town will take you further back in time. 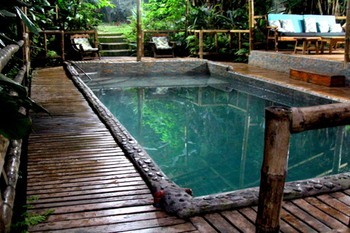 We will stop for a soak and a bite to eat at the Chachimbiro Hot Springs - some of the most healing waters in Ecuador, the chemical composition is high in iron, copper, iodine and other minerals. The water regulates the digestive system and stimulates the cardiovascular and central nervous systems. After the last little town of Cahausqui, we enter the Cotocachi-Cayapas Park again. This time it will be a dramatic entrance. On unimproved dirt roads, we have 30% grades that will immediately bring you up, and over the clouds gaining over 5,000 feet in under 2 miles. In your rear view mirror you'll catch glimpes of the snow-capped Cayambe Volcano, far in the distance. The road leads first through a magnificent pine forest and then, once over the tree line, you'll be riding on a ride at over 13,000 feet in elevation. You'll have tremendous views of the fertile valley below. It can be a bit chilly up here, so be sure to add another layer. From the peak, we'll ride down rocky switchbacks and back onto the Western Slopes of the Andes, and back into the green, mossy cloudforest. We cross a few rushing brooks and waterfalls with more opportunities for a swim. After crossing beautiful mountain pastures, we arrive in the small village of La Merced de Buenos Aires. Here is one of our favorite places to eat - in the small wooden restaurant that serves undeniably fresh trout, fished from the icy mountain streams that surround the town. The people are very friendly here and always surprised to see visitors from other lands in their small town. Say adios to our friends in La Merced de Buenos Aires and we will continue towards the west on unimproved dirt farm roads. We'll be riding through a series of small mountains that look like pyramids, passing trout fisheries, fruit and coffee growers. Along this road are two schools that are part of our Pack for a Purpose community initiative. We briefly join the E10 paved road at the ranger station checkpoint and then continue to descend in elevation, taking a small road out of the village of Limonal that leads deep into the fertile mountainous farmlands of the western Andes. Following a small roaring river with waterfalls will bring you through the hamlet of Primavera and just outside you will find the entrance to the Hacienda Primavera Wilderness Lodge. We will spend the night in what we believe is one of the most special lodges in the entire country. Its location is truly in the wilderness and this is a secret hideout for birdwatchers. The lodge is located within the El Choco cloud forest reserve which has primary and secondary forests, and guests can see a variety of tropical birds such as parrots and toucans. The lush forests surrounding the hacienda contain the largest amount of flora and fauna per square meter than anywhere else in the world. The tropical forests are abundant in endemic species, epiphytes and orchids. The Ecolodge has large rooms, spacious suites, a gourmet restaurant, a beautiful spring-fed pool and is part of a working horse and cattle ranch. The staff will be happy to show you around including the coffee plantation on the premises. The ride out of the rainforest and jungle on the dirt roads out of Primavera are outstanding. We will pass several waterfalls that and rolling brooks before climbing over a mountain pass in the Golondrina Protected Forest. We come into another valley and the small town of El Chical. We're now on the border with Colombia and the communities here grow coffee, cacao, exotic fruits and other crops. It is an idyllic part of the country nestled in a beautiful setting of mountains. 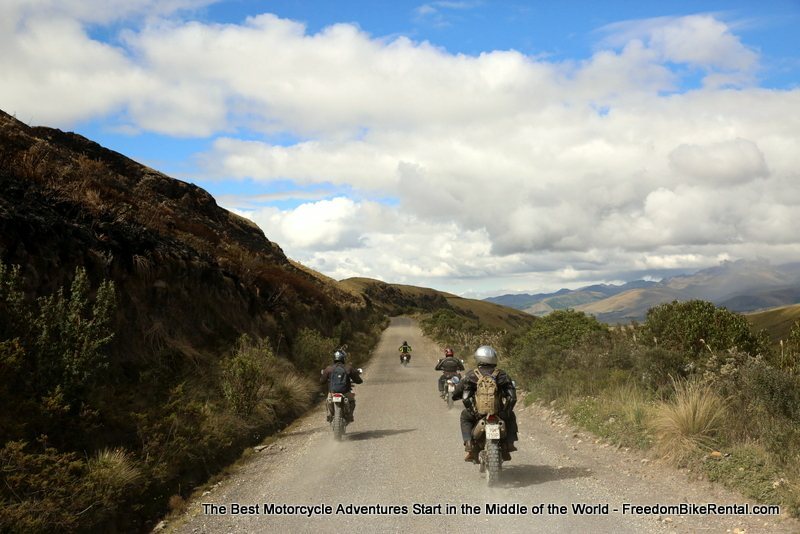 From El Chical, we head east, following the Colombian border and ride into the town of Maldonado. Maldonado is home to the Golondrina Coffee Growers' Association and here too you can get a taste of the coffee and a quick tour on how they grow, process and roast their coffee grown throughout this region. In Maldonado, you will see a lot of people with red stained fingers from picking coffee or rasberries. The coop’s members have created reforestation programs with the local communities and its members are encouraged to utilize organic practices to prevent further erosion and soil depletion. If you want to bring back coffee that is the rage of coffee snobs around the world - here is your chance! Once past the town of Maldonado, we begin a climb into the highland moorland (land with low growing shrubs and acidic soil) of the El Angel National Park. The Humid Moorlands of El Angel are filled with huge Frailejones (Espeletia pychnophyla), which grow as high as 20 feet and feature a flower that is similar to the sunflower. The leaves of the plant are hairy and serve to protect this interesting plant from the very cold climate that hits this region. Other beautiful flowers found in this area are the El Angel Flowers , which look very similar to the Frailejones with its hairy leaves and yellow flowers. 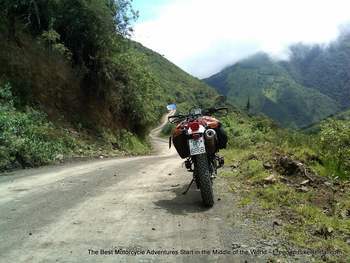 In the park you will go over the Volcan Chiles pass at about 13,500 feet and then ride next to the green volcanic lakes. It is an amazing landscape that you will always remember. There is no place on Earth like it. Once down from the Volcan Chiles pass, we follow an ancient cobblestoone road to the border with Colombia. Right exactly on the border is the Tufiño Hot Springs - as we approach them you will smell the sulphur from the source pools higher up - which are fenced off because they can be overpowering. But below, in the springs the water is very warm and a 10 minute soak will reduce your blood pressure significantly. We'll take some curvy paved roads into Tulcan - the capital of Carchi Province which is a border town, just 7 km from Colombia. Tulcan is famous for its Topiary cemetary - have a stop here to see all the amazing shrubs carved into animals and figures. It is truly amazing. We'll have a sip of the local drink called "norteña" at the newly remodeled central market which serves up other local culinary delights. From Tulcan - we take the old Panamerican highway through the pictoresque town of El Angel. You'll see a huge change in the climate - you're now in the very arid, dry desert. We take a turn off the Panamerican highway onto a very old cobblestone road - this is the original highway between Colombia and Ecuador - the one that Simon de Bolivar once traveled. The road is lined with various cactus and you'll see herds of goats shepherded by people in traditional indigenous dress. This is the setting of the magnificent Tunas and Cabras Lodge - a place we chose for its unique locatoin and luxurious rooms. The lodge is a working horse farm that also grows aloe and other medicinal herbs. Our stay here includes the use of any of the horses in the stable andwe'll go for a horse ride into this unforgettable landscape. The setting is stunning - in the desert surrounded by silver mountains. The pool and dining facitilies are top notch. You'll enjoy a room with a private jacuzzi with magnificent private views. Today will be another significant change in climate, culture and terrains. We'll head out of the desert and around the tranquil shores of Laguna Yaguarcocha (Blood Lake). It is here in 1495 that Inca leader Huayna Capac inflicted the final defeat on the local Cara people. Between 20,000 and 50,000 Cara were slain and their bodies dumped into the lake, turning the waters crimson. The Cara were such highly respected warriors that the surviving were employed as Royal Incan Bodyguards. The lake today is much more tranquil and is lined with tortora reeds, which are woven to make mats and canoes. The wide road around the lake is also the racetrack where races take place every year. We'll then ride through the historic center of Ibarra - founded in 1606 and known as the "White City" for its whitewashed colonial buildings. Here are stately squares overlooked by grand churches and colonial buildings sheltering garden courtyards. Ibarra's most delicious treats are helados de paila. 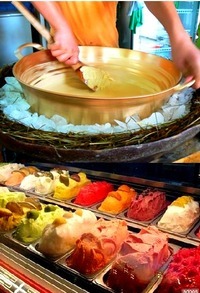 This sorbet rivals anyting you will find on the streets of Rome or gourmet restaurants in any part of the world. The only ingredients are ice, sugar, salt and fruit. The original shop of Rosalia Suarez - the originator of helados de paila - is a stop on the tour. You'll want to find your favorite flavor. Hacienda Zuleta cheese making facilities that make a variety of delicious ripened Andean cheese. A nice place to stop for a snack! Towering over the town of Cayambe is the Volcano of the same name - the only place on Earth where the Equator passes over snow. Cayambe is the regional center of Ecuador's flower industry and is well-known for its bizcochos - a rich buttery cookie. Once past Cayambe, you will have a chance to stand in two hemisphers at the same time at the Quitsato equator monument. The monument is a giant sundial, 54 meters across with a 10 meter high cylinder placed exactly on the Equator. With this sundial you can not only tell the time but the date of the year. The guides on site will show you how to do it. The monument is in honor of the ancient regional cultures who well understood these techniques of charting celestial movements and knew the position of the Equator, long before "more advanced" cultures. The museum onsite will explain how they were able to do this. Once in the southern hemisphere we turn onto cobblestone road that will take you up the slopes of the Cayambe Volcano and into the Coca-Cayambe National Ecological Reserve. This is one of Ecuador's most protected natural areas and a special permit is required for entry. We've got the permit and so we'll be some of the lucky few that visit this park every year. The park contains some 900 species of birds and we have personally seen wild puma and bear in the park. We then descend into the town of Oyacachi, where the descendants of those who fled the massacre at Laguna Yaguarcocha (see above) settled. The town has a beautiful hot springs with pools at various temperature where you can soak and relax. We will have a lunch at one of the simple restaurants that can prepare the local trout - from the crystal clear waters that run through here. They cook the trout over a wood fire. It is their special traditional cooking techniques that will probably having you say that this is the best trout you have ever had in your life! 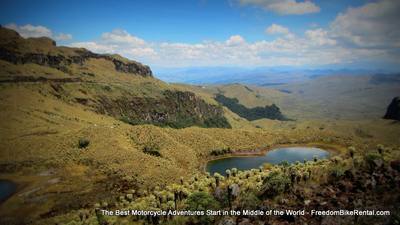 From Oyacachi, we pass through the more remote regions of the park, through the high paramo terrain. There are a few absolutely beautiful glacial lakes here that you should stop to see. Many people say this resembles the highlands of Scotland. You may catch photos of the condor or mountain toucan in this area. We end the day's ride soaking your limbs in your private hot spring bath outside your private, adobe thatched cabin at the Termas Papallacta Hot Springs Spa & Resort. 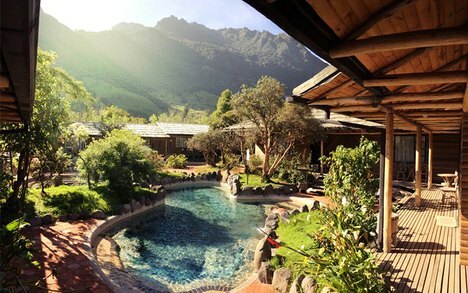 There is no better way to relax than staying at this award-winning luxury resort, high in the Andes. After a full day of riding you will desrerve the pampering! Today is a day for relaxation. You'll enjoy your luxurious cabin and can take some time to explore the trailsand surrounding of the resort. They offer many special spa treatments and horseback riding in the area. Our ride back to Quito starts by ridingover the Papallacta pass - the continental divide at 13,400 feet. 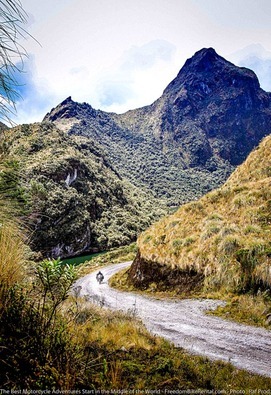 You'll ride back into Quito on the same cobbled road that Francisco de Orellana walked on his famous trek to the Amazon to find the fountain of youth for the King and Queen of Spain. On the way back up to Quito, have a stop to see the Guapulo Church and stop in the art galleries of this bohemian neighborhood which hangs perilously off the side of the cliff. 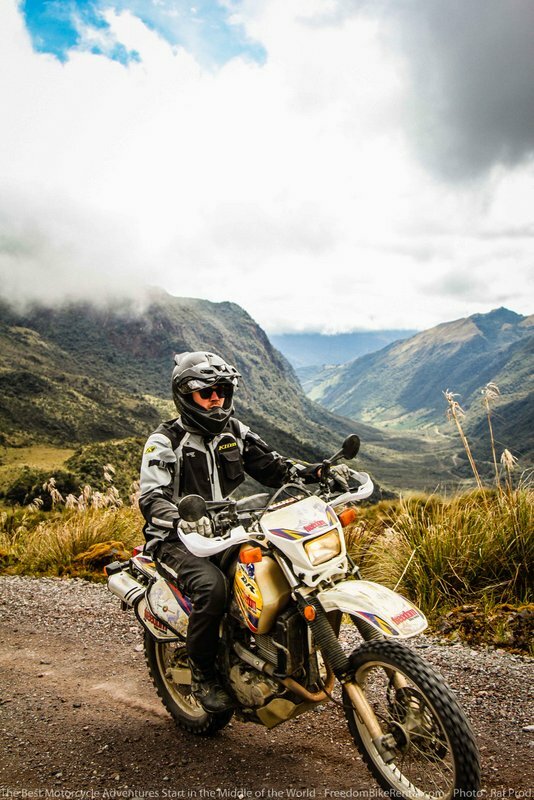 For those looking for additional riding on the last day, we can provide an alternate route to visit the Laguna Muerto Pungo - a beautiful unpaved route through highlands paramo. Many international flights leave around midnight from Quito. If you are catching a flight the same evening as the last day of the tour, you may enjoy VIP access to our "Freedom Riders' Lounge" - complete with a hot shower, jacuzzi, gym, and honor bar before your flight home. 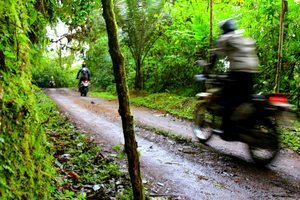 This trip has an activity rating of 4/5 and is one of the most demanding tours we offer, meaning this tour will put you to the test physically; travelers should be in good health and comfortable riding for extended periods of time through adverse weather and at times unpredictable road conditions. The itinerary suits a wide range of interests and abilities, with options for light and moderate activities . Much of the trip takes place in remote areas where medical care can be several hours away. Please note there is one long riding day. Weather and temperature ranges in Ecuador are generally the same year round. In the highlands, you can expect the chance of passing showers but rarely a full day of rain. Chances for a full day of rain are more likely on the western slopes of the Andes in April and early May. There are no weather forecasts on Ecuador radio or TV stations; it is generally impossible to predict the weather in the Tropical Convergence Zone and in such a diverse number of climatic regions and elevations. On this tour, temperatures will be between 40 and 80 degrees fahrenheit (4-27 celsius). The extreme cold temperatures are only experienced at the high elevation points (refer to the elevation profiles on this page). These low temperatures are brief but you should be prepared with extra layers including a wool sweater and winter gloves. For a more comprehensive explanation about weather in Ecuador, please see this page. Throughout the tour, we stay in ideally located, high-end accommodations with many amenities. See the detailed itinerary on this page for details and links to the accommodations provided. Ecuador Freedom has the right to substitute accommodations of equal or better quality due to availability and we will notify you of these changes in advance when possible. 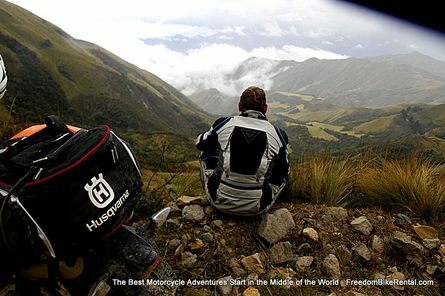 Ecuador Freedom will provide you with detailed information to prepare for the ride, including a packing list. A special 25% discount is available on all Klim riding gear once booked. Hacienda Cusin is a restored, 17th-century estate and very personal hotel with its 38 attentive staff and famous gardens. Furnished with antiques and select Andean craft, most with log-burning fireplaces & beamed-ceilings, overlook several acres of landscaped perennial gardens, ancient trees, and often snow-capped mountains. This hacienda is located in the Choco Rainforest, kind of in the middle of nowhere. It is very luxurious with a spring-fed pool, private coffee plantation and horse farm. It feels like a drug-kingpin hideaway in the middle of the forest, just over the border from Colombia. Its a fantastic place and you'll be treated like a king in this very special place. The Tunas y Cabras Lodge is located in a unique, desert landscape. It offers luxurious rooms, fantastic dining, horse stable, pool, jacuzzi and an educative medicinal herb garden. Try their homemade jam made from the cactus fruit that grows on the grounds. This is Ecuadorian Luxury at a new level. With a private hot spring pool outside your cabin door, its an amazing place to relax and soak your body to relieve the stress from riding. With a full-service spa offering beauty treatments and massage plus fine dining, it is a paradise! Let us know, and we'll put it into the calendar if possible. VIP access to the Freedom Riders' Lounge™ with hot shower, jacuzzi, gym, and honor bar. We also recommend Ripcord Travel Insurance, a partner of ours. They provide very extensive travel insurance plus outstanding repatriation and assistance in an emergency. To purchase, just go to this page.